Construction in The Illinois Building is far from finished, but our first tenant, Giordano’s Pizza is thriving three months after opening. 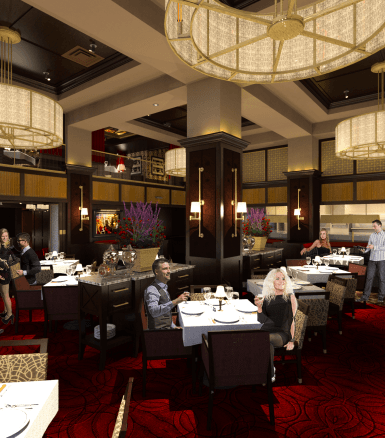 This October, Indianapolis foodies have another restaurant to look forward to: Hyde Park Prime Steakhouse. Hyde Park will have three private dining areas, two fireplaces, second floor seating, unique paintings on the ceiling, a grand central staircase, and a display kitchen so customers can see food prepared. The steakhouse will be just as elegant as The Illinois Building it is housed in, with marble floors, 16 foot ceilings, and ornate woodwork. Although our team has stayed on schedule, building such an amazing restaurant space has not come without challenges. “Fitting a modern, high-end restaurant into a historical building protected by a host of state regulations has required our team to be flexible, attentive, and creative,” Keystone Construction Project Manager Milan Stojkovic explained. Despite these roadblocks, the team was able to preserve the original vision and move the project forward. We can’t wait to welcome visitors to Hyde Park this fall! To learn more about the Illinois Building, explore Keystone Realty Group’s portfolio page.